For historians, World War II buffs, and veterans’ families, this book offers a unique take on world events at the micro level. That Lucky Old Son is not to be missed. Mark Cote’s moving and richly detailed biography That Lucky Old Son is a rare gift. During World War II, Len Cote flew bombing missions over Germany. His plane and crew went down behind enemy lines in 1944. When he died in 1967, he was still too young to have thought about leaving a memoir—a task that did, however, occur to his son. That Lucky Old Son is a remarkable work, the result of deep research, personal interviews, and a fully engaged imagination. 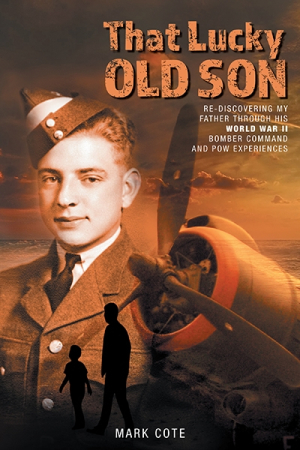 The narrative intersperses a gripping re-creation of Len Cote’s war service with the boyhood recollections of his son. The writing is excellent from start to finish, pulsing with an immediacy that brings the story to life, whether through the taut excitement of being in a bomb bay over Germany or the surge of triumph that comes when a patriot in occupied Denmark risks his life to send up three flashes to let others know that their bombs hit the target. It also includes less cinematic details from daily life: the luxury of fried eggs on toast—a dinner reserved for bomber crews about to risk their lives—and the discomfort of breathing through an oxygen mask at cold, high altitudes. Members of Cote’s flight crew emerge as fully formed individuals—casual about their hardships, silent about their heroism, and quick to crack a joke. Their personal fates become matters of concern, filling each bombing raid with the kind of suspense usually reserved for fiction. Conversations help to round characters out, rich as they are with service slang and acronyms. One of the most gripping parts of the book tracks Cote’s emergency bailout behind enemy lines. When he is taken prisoner with several other members of his crew, the book’s depiction of his casual courage in the face of uncertain survival is riveting. The interspersed memories of Cote’s son deliver a satisfying portrait of the veteran as postwar family man. These sections also convey a sense of what a strange experience it must have been for soldiers, so recently part of a war-torn world, to abruptly return to a land of peace and relative prosperity. An author’s introduction effectively lays the groundwork for the story, while a helpful and entertaining appendix explaining the slang in use at the time is also included.